MSI 4.0 (Vista+) introduced the Restart Manager (RM) that evaluates file locks during the InstallValidate step in the execute sequence. There’s a chicken and egg problem here. It evaluates file locks and displays the FilesInUse dialog to the user, and THEN runs our custom action to do the /unregister type custom actions on the files to stop running services. It’s not possible to run our /unregister CA before InstallValidate because the condition Remove=”ALL” isn’t set yet, so there is no way to know when we’re uninstalling. In testing, the UI Sequence CA to stop our running services worked in that it suppressed the FilesInUse dialog, but not reliably. // Attempt to stop all services. 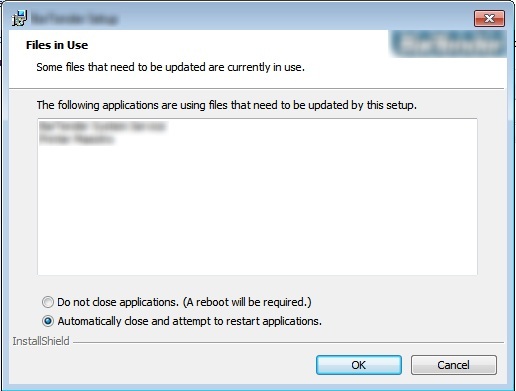 // above code removed FileInUse dialog, but installer was still showing "reboot" prompt. Adding timeout was the only solution. If I knew what RM was checking to determine file locks, I could at least make my code check for the same thing and only then give control back to the installer. 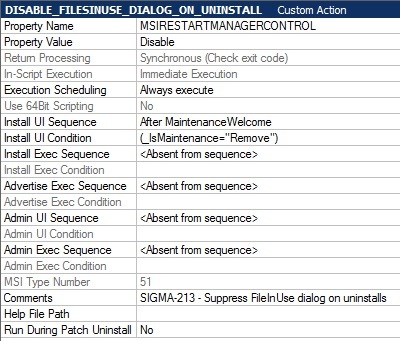 The following custom action supresses the FilesInUse dialog only on UI uninstalls. Keep in mind, this was for a service. If you have an application that won’t close, it’s most likely that the Restart Manager API calls need to be added to the source code of the application. You can find information on that at Codeproject.com and AdvancedInstaller.com. Luckily I (currently) don’t have to deal with installing services. I’ve had a similar issue with a past job though (using windows server). We went about it pretty different. Maybe I’ll recall my notes and blog about it one day. I like the solution you came up with though. Nice article, perhaps you should make your conditions component-based, we’re doing this usually because of our underlaying merge modules. I’m also using service (unmanaged) CAs for stopping managed services, so I can give you the advice to kill the service process after the stop, because there still can be something in the threadpool after the service stop. Regarding best practices, we should not change anything on the machine during UI sequence? How do you handle Rollback in your installer? I think you’re leaving the transactional idea of installation if you manipulate services during UI with fire-and-forget actions. Normally, workflow of installutil: uninstall stops, disables and deletes the service, but with a service stop before it makes this undesired behaviour. Hi Ferdi! Thanks for taking the time to share. Yes, what I provided was for the blog post, but I had added component based conditions. I was able to move() the file with no problem, so there was no lock on the data on disk. However, I can point out that this seemed to be specific to our managed services (C#) and not our unmanaged (C++) services. The C++ services stopped and exited with no problems and were not displayed on the FilesInUse dialog. What you say is probably on the right track as it pertains to thread-pools, and is likely the cause. Maybe something relating to garbage collection. Someone should investigate this. >Regarding best practices, we should not change anything…. Yes. But ‘best practices’ can only be adhered to when the software works as it was designed. If it does not, as it does not in this case, then we are forced to resort to hacks of sorts. 😦 I don’t want my blog to be about philosophical arguments, I want to find solutions. Let’s be honest, a software architect can only design for the outcomes they can think of, if there’s an exception they didn’t plan for then it’s no longer possible to follow these ‘best practices’. Regarding how I handle Rollbacks? Yes, I use differed context for system changes with rollbacks. You’ll see that the solution I used at the end was a simple property change (non system change) so it does follow ‘best practices’. Alas, I’m just a guy. I do not have answers to the mysteries of the universe. um, 42? Sounds like your not using the ServiceInstall table? As a test, can you do an “SC DELETE “? Beyond that, I’m useless. The IS forums are very helpful though. Again, thanks for taking the time to share, Ferdi! Thanks Ryan, I’ve fixed the broken links you pointed out.